Have a big fat Indian family? Are you or your spouse-to-be or both as a couple super popular among your peers? Is your guest list extending by the day? Finding it hard to strike off names from the guest list because you have a big-big heart (and bank balance, kidding) and want no-one to miss your big day? These large capacity wedding venues in Mumbai are the blessed answers to all your questions. Whether there are hundreds or thousands of guests joining you to partake in your wedding celebration, choose any one of these wedding venues in Mumbai that are sure to comfortably accommodate a large gathering. Explore! Always dreamt of a perfect sunset wedding? Making it a reality for the oh-so-in-love couples is the Novotel located at Juhu Beach. This banquet hall in Andheri offers a resplendent poolside lawn at your disposal to host a dreamy wedding and when such a gorgeous wedding venue can accommodate a large capacity with ease, could one ask for more? More than a thousand guests in tow? Make Novotel part of your shortlist. To know more, check availability and get instant quotes: Click here. Luxurious weddings, demand luxurious wedding venues! A Stone’s throw away from the Domestic Airport; we have Sahara Star that offers one of the largest pillar-less banquet hall, a whopping 55, 000 sq. ft. Yes! Crazy! The large capacity of this wedding hall coupled with its exquisite interiors is simply mind blowing. 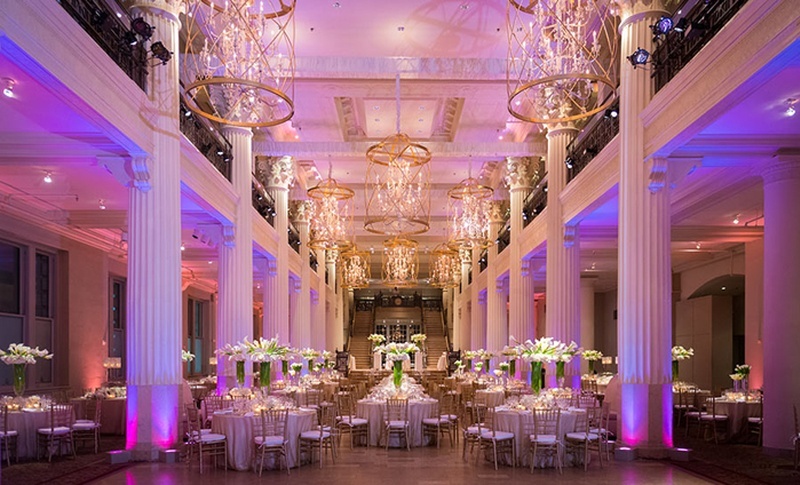 Your grand wedding cannot get much grander than this! Planning a Catholic wedding and looking for a venue where you can accommodate a large number of guests in cluster seating, along with a dance floor. Sahara Star might be the right match. Whether it’s a beach-front wedding or a poolside wedding, this venue doesn’t fail to impress. When such a scenic wedding venue easily accommodates a large capacity of over 1000, you know you’ve found a magical match to your wedding venue hunt. With indoor options available to host your grand pre-wedding celebrations, the outdoor open lawn section is impeccable to hold a heavenly reception under a starlit sky. Making your once-in-a-lifetime experience a memorable moment to the T, Asian Banquets offers 7200 sq. ft. ballroom for those looking out for a luxurious wedding venue in Bhandup, the central line of Mumbai. The ballroom is fully equipped with audio capabilities and state-of-the-art lighting that set the right mood for your grand celebrations. Their mesmerising décor and mouth-watering delectable are an added attraction. Royal is what royal does. A wedding venue that has royal written on ever brick and wall is brought to you by The Leela. Its Grand Ballroom can, with no trouble house over a thousand guests and with a hands-on events team by your side, this venue is sure to meet and exceed your expectations. Should you need to host your pre-wedding functions at The Leela, their Grand Ballroom can be divided into 5 sections to accommodate your varying arrangements. Is winter wedding on your mind? Looking for an absolutely gorgeous large outdoor wedding venue? Sanoor Banquets is your answer. The hotel’s lush-green lawn area is a perfect choice to host a fairytale wedding with large guest in attendance. The decorators and DJ of this venue in Ghatkopar create the right setting and mood on your big day. Let’s not miss out mentioning their caterers who do a swell job with the variety of food options they offer. And when all of this is offered on a budget it’s simply ‘sone pe suhaaga’. Are you a sports lover? Even if you’re not, how does the idea of celebrating your union on a football field sound? Interesting, isn’t it?! We thought so too. Celebration Sports Club’s football ground is let out for couples who want to host their grand big fat Indian wedding on a budget. Other than the ground, the club also features a poolside lawn and a banquet facility that can be perfect choice for your pre-wedding functions. Don’t like the idea of hosting an outdoor wedding on a lawn, simply because your heels sink into the grass? Or find it too messy to deal with? The Club comes to your rescue. Offering a 23, 000 sq. ft. large capacity wedding venue with granite flooring, excellent outdoor lighting and built-in buffet counters, The Club’s Colonial Courtyard is indeed bliss. Have a larger than life guest list? You can club the Colonial Courtyard with its Colonial Hall for an indoor, as well as an outdoor celebration. Extending luxury all the way to Navi Mumbai, Imperial Banquets offers the best large capacity wedding venue, one that is awe-inspiring in make and presence. Personal and attentive service combined with exceptional food quality is a trademark of this venue. If an authentic and traditional wedding is your way of celebrating your union, their in-house decorators ensure you receive a one-of-a-kind set up. The name figurative to a grand celebration, we have Grand Hyatt for ones looking to host their big fat Indian wedding in the most unparalleled style ever. Offering elegance and attention to detail, their wedding venues and expert event planning team assist you in translating your dream wedding into an opulent reality. Their grand ballroom is a sophisticated indoor space on offer that can effortlessly house a large capacity. Perfect for a larger wedding reception that spells style, The Grand Hyatt, also has other smaller banquet facilities that are perfect to host your pre-wedding functions.